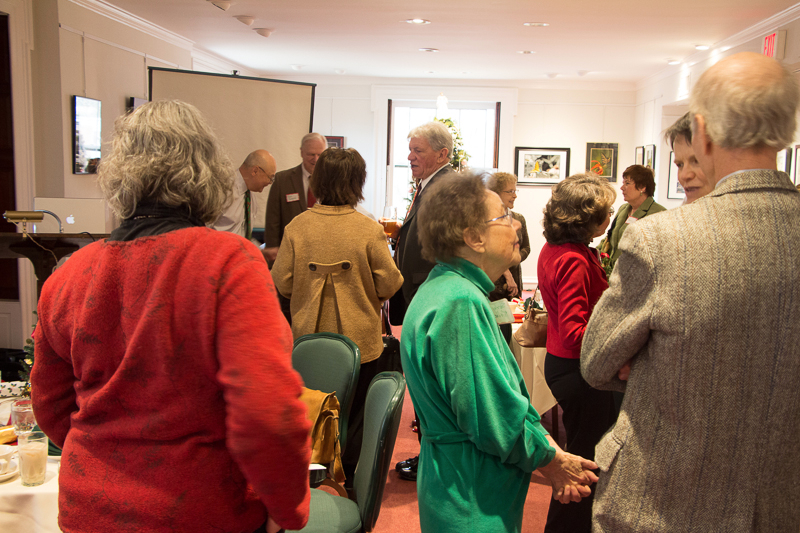 On Saturday, December 7th, the Welsh Society of Western New England reconvened at the Town and County Club in downtown Hartford for their winter gathering. The club features wonderful seasonal decorations over the holidays and was a very warm and inviting venue for our troop. Several of our far-flung members were present, in addition to several new faces who had learned of our organization through articles in area newspapers and magazines. 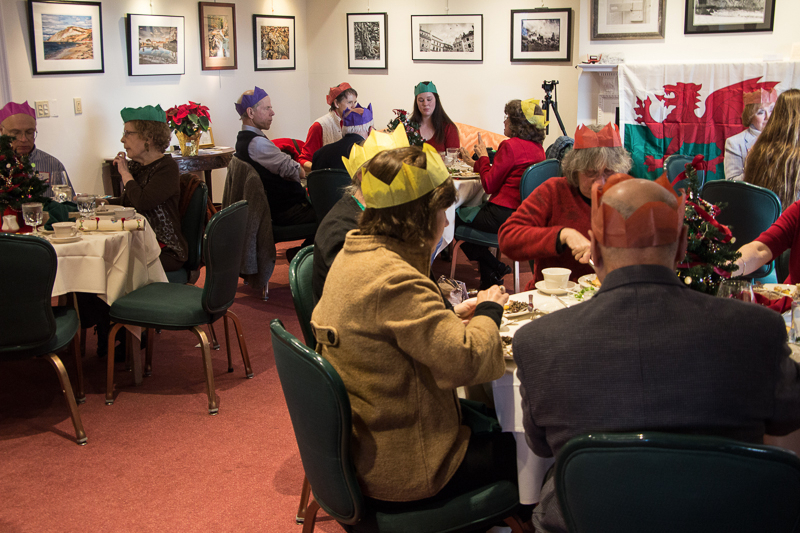 As we sat down to lunch we indulged in one of our favorite Christmas traditions – crackers. Heads previously bare were adorned with a cacophony of paper crowns as jokes were traded across the tables. A little levity goes a long way, and the good nature of our group fosters more than our fair share. Pamela Petro, a multi-talented artist who teaches creative non-fiction at Smith College and for Lesley University’s MFA in Creative Writing, was one of the featured guests at our gathering. She is the author of three works of travel literature and has written for publications such as The New York Times. Kasha Breau & her harp. We also had the pleasure of welcoming Celtic harpist Kasha Breau. After a short introduction about the harp and a brief tune-up, Breau launched into a set that sampled music from her wide repertoire. Naturally, she presented several Welsh and Celtic tunes, including the Irish traditional Dun Oiche and the Welsh Machynlleth. The song Merch Megan came with a story about its composer, John Perry, a blind harpist from the 18th century greatly admired Handel. 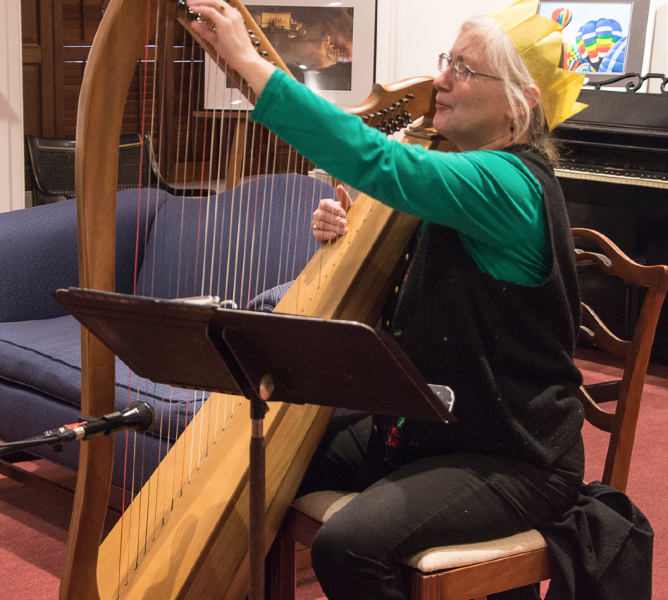 To finish the evening, and in keeping with the holiday spirit, she also played several carols to which we joined our voices. By the end of the gathering, spirits were high and heads were clear as we gathered around the piano to sing the National Anthem. The lyrics, these powerful invocations of Welsh spirit and history, took a different shade of meaning for me. The music and words shared with us that day came from individuals who themselves are part of the myriad beirdd a chantorion within the legacy of Wales.